Rubber wood and poplar is finished in hand-rubbed white and upholstered in light grey leather. A curved back and cushioned seat surrounds you in style and comfort. 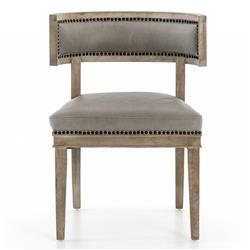 Antique brass nail head trim adds a lustrous accent to this luxurious dining chair.